Competition may come and go, but the Aprilia RSV 1000 R remains the unquestioned top dog among supersport motorcycles for its amazing handling on road and racetrack. The Aprilia RSV 1000 R has shown its competitive edge in world endurance racing, where it is the only production twin able to compete on even terms with the best four cylinder machines in the world, as demonstrated by the excellent results achieved. Legendary races like the Le Mans 24 hours and the massacring Bol d’Or 24 hours have shown exactly how effective the twin cylinder Aprilia RSV 1000 R is on the racetrack , and how totally reliable it is too. Endurance racing has provided more than just an unforgettable experience. It has served as a valuable test bench for the latest technical solutions now appearing on Aprilia production bikes. The Aprilia RSV 1000 R is determined to maintain its supremacy as the best sports twin money can buy, for its advanced technology and for its amazing performance. But what counts the most is the fact that the Aprilia RSV 1000 R is still the bike to beat when it comes to ease of riding. Because riders feel so instantly confident on an Aprilia RSV 1000 R, they really can ride at the limits of their abilities and stay totally relaxed too. The benefits are obvious in terms of less physical and mental stress, faster and safer motorcycling and the ability to remain fully concentrated for far longer, factors that contribute to success on the racetrack and safety on the road. 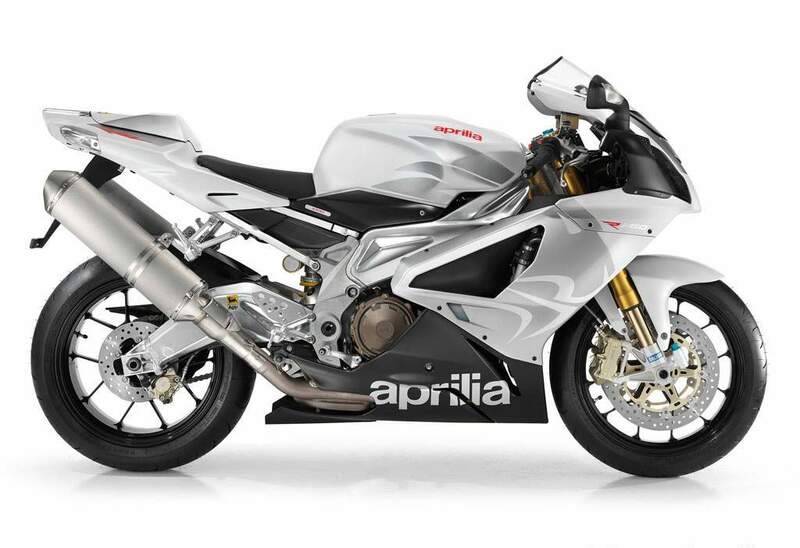 Constant technical development has enabled Aprilia’s engineers to carry on improving the performance of the motorcycle that already represented the state of the art for twin cylinder supersport machines. In this latest RSV 1000 R, the V60 Magnesium engine is not only cleaner but even more powerful, confirming its reputation as the world’s mightiest production twin. The modifications needed to achieve homologation to strict Euro 3 standards have not stopped Aprilia squeezing another 4 horsepower out of this amazing engine. The latest powerplant delivers 105.24 kW (143 HP) at the crank to push the bike to a top speed of over 280 km/h, aided by improved aerodynamics and even more efficient engine breathing. Even the chassis has been updated using the experience gained from a year of international racing that has seen the RSV defeat all rivals on the world’s stock racing circuits. This unbeatable engine and chassis go hand in hand with top-quality components, and an even higher level of prestige equipment, placing the Aprilia RSV 1000 R in a class of its own not only in performance but in quality to price ratio too. The 1000 cc V60 Magnesium engine has long been the standard setter for production twins, but constant evolution and development at Aprilia’s R&D department have now made it even better. 33 mm Exhaust valves and new, larger diameter exhaust headers have been fitted to improve engine breathing. In this form the V60 Magnesium now puts out even more power, topping 143 HP at 10,000 rpm without losing any of its legendary usability and proverbial Aprilia reliability. The new satin finish silencers have catalytic converters installed nearer to the collector pipes. This solution has reduced converter activation time by 50% while further reducing the level of exhaust emissions. The Aprilia RSV 1000 R conforms easily to the strict limits required for Euro 3 homologation. The second section of exhaust has also been extended by 200 mm to boost torque at low revs. Optimised fluid dynamics inside the cylinder heads has been enhanced by improved mapping of the combined ignition and fuel injection systems to achieve higher power throughout the useful rev range. The V60 Magnesium breathes through the ‘Air Runner’ dynamic air scoop located in the middle of the nose fairing. This has been redesigned to increase air flow to the engine’s ‘lungs’. The Air Runner scoop is located precisely where dynamic pressure is highest, exactly along the bike’s centreline. From the scoop, an air duct passes through the steering head to take ram air to the generous 10.3 litre airbox. A choke valve inside the duct, controlled by the engine ECU, regulates flow to provide the engine with air at exactly the right volume and pressure. The engine therefore packs incredible punch right through its extended speed range, enabling the rev limiter to be set at 11,000 rpm. The mighty roar of the V60 Magnesium is muffled by two differential volume Helmotz resonators to reduce intake noise at the most critical engine speeds. The airbox also houses an idling motor. This operates an electronically controlled valve that deviates air downstream of the butterfly valve to make it easier to start the engine from cold and to stabilise engine idling. The Air Runner also performs a structural function. It incorporates two lightweight aluminium arms to hold the cockpit fairing and headlight so that there is no need for ugly brackets. A new panel type air filter reduces pressure drop and improves engine efficiency. The engine’s fuel injection system features 57 mm throttle bodies and one injector per cylinder. Thank to the Air Runner ram air scoop, pressure in the airbox increases as the bike accelerates, leading to a 3% gain in power at maximum speed. The flash EPROM already contains racing mapping for unrestricted exhausts. Aprilia service engineers can easily change mapping on request from customers who intend to use their bikes exclusively on the racetrack. All engine data passes through a CAN (Controlled Area Network) line to the instrument panel, which also acts as a diagnostic terminal. In the unlikely event of a malfunction, it is a simple job for service engineers to identify problems. The CAN line uses only two wires to transmit all data. This simplifies the electrical system enormously as well as reducing the total weight of the bike. The RSV 1000 R also has a close ratio gearbox, to make it easier to make full use of the amazing power of the V60 Magnesium engine. Despite so much technical evolution, the characteristics that made the original RSV stand out are still there. - Longitudinal 60° V twin engine with 4 valves per cylinder and double overhead camshaft, driven by a mixed chain and gear system. - Electronic fuel injection with 57 mm throttle bodies, one injector per cylinder, and an ‘Air Runner’ ram air scoop. - CDI ignition with one plug per cylinder. Ignition is controlled by the same integrated engine management system that also controls fuel injection. - Dry sump lubrication with double trochoid pump, separate oil tank and oil cooler. - Mixed gear/chain valve timing drive with the two gears (one per timing chain) located in the crankcase to reduce cylinder head dimensions. - AVDC (Anti Vibration Double Countershaft). - Hydraulic action clutch with radial master cylinder assisted by the patented PPC (Pneumatic Power Clutch) system to control rear wheel bounce during fierce braking. Years of racing at the highest levels have allowed Aprilia’s R&D section to design a frame that is acknowledged as the best production bike frame around. One of Aprilia’s fixed objectives when designing the RSV 1000 R frame was to achieve perfectly centralised mass. In line with Aprilia practice, the frame incorporates aluminium-silicon castings and Peraluman 450 pressings. The frame has been optimised by extensive finite element analysis and boasts excellent torsional rigidity though it weighs only 9,650 grams, a figure matched only by specialist racing frames. Aprilia’s obsessive search for perfection, plus the experience gained from production bike racing has nevertheless led to small but important improvements to what was already the best frame on any machine of this type. The steering head’s rake angle has increased from 24° 45’ to 25° to give a slightly longer trail. Stability is better as a result, so that the new RSV 1000 R inspires even more confidence than before, without losing out on its acclaimed agility. The new RSV 1000 R swingarm is made from extruded Peraluman and Al Si7 castings. Its double arch design provides a clear passage for the new twin silencer exhaust system. Here too, cross-sections and wall thicknesses have been optimised using finite element analysis. The RSV 1000 R swingarm weighs only 4,860 grams, well under the swingarm weight benchmark of 5 kg. The fantastic Öhlins Racing fork fitted as standard to the RSV 1000 R represents the state-of-the-art for this most important of all components in determining how a motorcycle handles. The new fork has 43 mm stanchions with titanium nitride coating for a friction-free sliding action. Its advanced design with longer sleeves and shorter fork bottoms reduces load at two critical points, the slide bush and the stanchion to fork bottom joint). Wheel travel is 120 mm. Like all top racing forks, the Öhlins allows precision adjustment of compression and rebound damping as well as spring preload. The Sachs rear monoshock incorporates a separate piggy back nitrogen cylinder and is also adjustable in preload, compression and rebound. A characteristic unique to Aprilia is that the length of the monoshock can be adjusted directly from the unit itself so that the rear end of the bike can be raised or lowered to achieve whatever setup may be required and to match rider preferences and other suspension adjustments. Top supersports demand top quality brakes. The RSV 1000 R is again at the cutting edge of technology, and is equipped with Triple Bridge, radial caliper front brakes developed by Aprilia in conjunction with Brembo. The 320 mm floating steel discs on the front wheel feature narrower braking bands for reduced wheel weight and inertia and therefore more agile handling. The RSV 1000 R’s radial calipers are combined with a radial master cylinder to form the most sophisticated braking system fitted to any current production bike. What places the Aprilia RSV 1000 R in a class of its own is the care taken in its design and manufacture and the attention paid to every single component on the bike. The result is increased performance and functionality, with reduced weight and a quality of finish that no other bike can equal. - Öhlins Racing fork with titanium nitride (TiN) coated stanchions. - Aluminium steering pin and bottom yoke. - Brembo Triple Bridge radial front brake calipers. - Forged caliper mounting blocks for greater rigidity and stability under braking. - The combined digital and analog instrument panel receives data on all engine control parameters over a CAN line and incorporates memory to allow it to act as an integral part of the self-diagnostics system. The instrument panel provides the same readouts as the previous model (including a self timer with a 40 lap memory), but is now extremely modern and compact in design and weighs only 220 grams. All functions are controlled by three conveniently located keys. The LED backlighting may be set to three levels and is white for the analog instruments and red for the digital display. - The headlight cluster incorporates four lights for perfect night riding vision. The great care taken over the design and finish of the RSV 1000 R also transpires from little but important details like bulb holders made from blue anodised aluminium. - The white lens direction indicators are fully integrated in the bike’s body. The front indicators are moulded into the rear view mirrors while the rear indicators are built into the tail. This means that there is no need to remove them for track use. The rear number plate holder can also be removed quickly and easily to comply with competition regulations. - Even the ignition key is specially made for the RSV 1000 R and carries an internal identification code. The ignition block has an immobiliser fitted as standard. Since Aprilia first introduced its RSV1000 Mille back in 1998, there have been plenty of different models of the V-Twin machine, the latest being the most advanced and well handling yet. 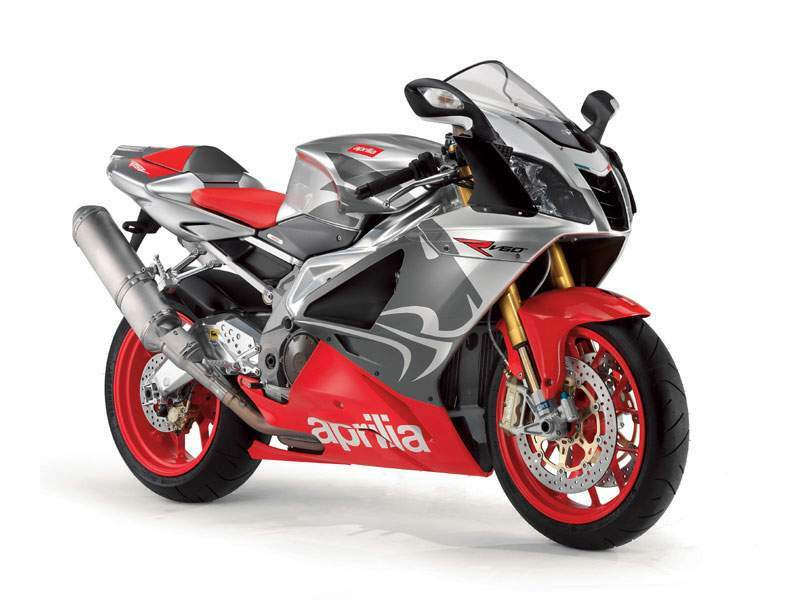 Aprilia RSV 1000cc sportsbike models have included standard versions such as various Mille models from 1998-2003, before changing the name from Mille to simply the RSV1000R as the standard model when big design changes were made in 2004. The special models have included the SBK homologation Mille SP in 2000 - a bike which took eight race wins, eight poles, and 26 podiums in the limited time it spent racing in the World Superbike Championship - the Noriyuki Haga replica in 2002, the Colin Edwards replica in 2003, and in 2004 the first of the RSV1000R Factory model was released. 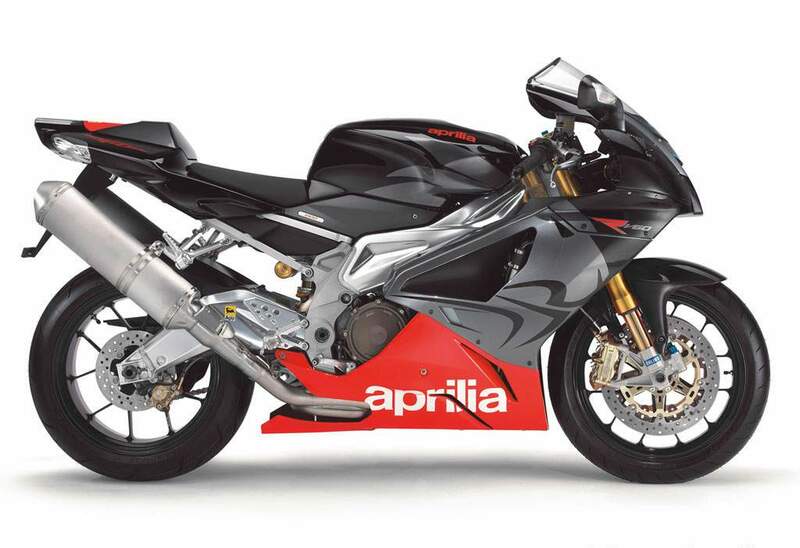 For 2006 Aprilia has the standard RSV1000R and also the RSV1000R Factory version available. Both are quite similar feeling but the Factory features a few different key component upgrades to justify its $4000 more expensive price tag. The world launch was held at the Losail Circuit in Qatar, a perfect track with all its flat corners to showcase the torque that the V-Twin engine roars out. With so much technical evolution over the years, the characteristics that made the original RSV stand out are still there today, including the longitudinal 60-degree V-Twin engine, electronic fuel injection with 57mm throttle bodies (one injector per cylinder), and the 'Air Runner' ram air scoop. The RSV's engine also incorporates the AVDC (Anti vibration double countershaft), and the hydraulic action clutch, which features Aprilia's patented PPC (Pneumatic power clutch) system to control rear wheel chatter under braking. Italians are passionate about motorcycling, and all of Aprilia's new models display this. Just taking a glimpse at both the RSVs shows how much effort has been put into these beauties. Listening to the Aprilia technicians and press representatives speak about the two bikes tells the story even more. They want the RSV to stand out in a crowd, be different and original. The RSV1000 is definitely an individual. The standard version of the RSV range is the R model, which retails in the U.S. at $13,999. The new '06 version looks better in every way compared with previous models. A new fairing is introduced with bigger air vents for improved cooling and a more enveloping fairing design near the 'pegs has improved aerodynamics. It has a new ram-air intake with aerodynamically shaped edges for better air flow and less wind resistance. The tail section of the new RSV is now much slimmer and higher, giving it a more aggressive look, much like that of the new Tuono. Even the windshield is new on the RSV, a little bit lower, but shaped to escalate the wind around your body. The fuel tank and side panels of the bike have been reshaped to give it a narrower feel in the riding position and a more compact feel in general. Another thing to note with the fairing on both RSVs is that it is now easier to remove. The side panels are now made from just two pieces per side to make access and maintenance easier. The front and rear lights have been updated for '06, with the headlight featuring four separate lights that work in pairs, eliminating the lopsided look of many modern sportsbikes. The tail light is now comprised of 16 LEDs with a clear white lens that fits perfectly into the compact tail section of the bike. The biggest change on the '06 RSV1000R is that it now adopts the 43mm Ohlins racing fork that was only featured on the Factory model in previous years. Ohlins forks are generally more sensitive to adjustments, have a titanium-nitride coating for less friction and radial-mount brake calipers. The rear shock is the same Sachs monoshock as was used on last year's RSV. Both the front and rear suspension are fully adjustable. On the track the suspension package allows a comfortable ride with reliable, consistent feedback. The fork is excellent, giving plenty of feedback, and is a fine upgrade for those in the market for the R model. I found the set-up on the Sachs shock too soft, or maybe that the rear ride height was a bit low. The steering rake angle has now increased from 24 to 25 degrees, also giving it a slightly longer trail. The longer trail improves stability but the bike still remains agile in the corners. That alone was the thing I enjoyed most about both the R and the Factory version - they are stable and always give a good sense of where the bike is beneath you. Pulling up the RSV for the corners is never a problem with the radial-mount Brembo brakes that clamp to the 320mm floating discs. The radial calipers are combined with a radial-mounted master cylinder to form what Aprilia says is the most sophisticated braking system fitted to any current production bike. I must say that the brake lever has the longest reach I have ever felt, even when it is wound fully inwards. In the 'V 60 Magnesium' engine department of the RSV1000R, the major change is the exhaust valves which are increased from 31mm to 33mm, and it now has larger-diameter collector pipes. This latest engine releases 143 hp (claimed) at the crank at 10,000 rpm (compared with 139 hp in '05) and gives a smooth yet exciting feel out on the race track. The bike pulls nicely from around 7000 rpm, and I chose to upshift the gears just after the 10,000-rpm mark, quite a ways before the 11,000-rpm rev limiter kicks in. The new silver-finish silencers have catalytic converters installed near the collector pipes, bringing the RSV1000R well inside the strict parameters required for Euro 3 homologation. The secondary exhaust section has also been extended by 200mm to boost torque at low revs. The combined digital/analogue instrument panel is easy to read and features all the same readouts as the '05 model but is now extremely modern and compact in design. It receives data on all engine control parameters over a CAN (Controlled Area Network) line and has enough memory to allow it to act as an integral part of the self-diagnostics system. This makes it easy for an Aprilia service tech to find a problem if the bike has a malfunction. Everything on the RSV just seems to fit together well. Ergonomics on Aprilias are always comfortable, thanks to the top-of-the-line components used by the Italian manufacturer. The upright but racy seating position of the RSV gives it an all-round excellent feel for the road or the track. The word 'factory' is often used to describe race bikes that are simply unavailable to the public. It's a word that is often used for special bikes, made for equally special riders. Since 2004, Aprilia has applied the name 'Factory' on its top model in the RSV1000R range. The RSV 1000R Factory is a pretty special bike indeed, and features quality upgrades throughout the bike to make the ride that much more enjoyable. It isn't quite a full-blown factory race bike, but has enough gear to justify its name and the upgrades are mainly an advantage for track use according to Aprilia. The RSV1000R Factory features the same V60 magnesium engine as the R model, the same exhaust, frame, swingarm and brakes. The Factory bike comes in one colour; an aggressive looking Gold/Black. It has a gold frame, gold-anodized wheels and, mixed with the black fairing, this bike looks mean. The swingarm is polished instead of painted for greater wear resistance. 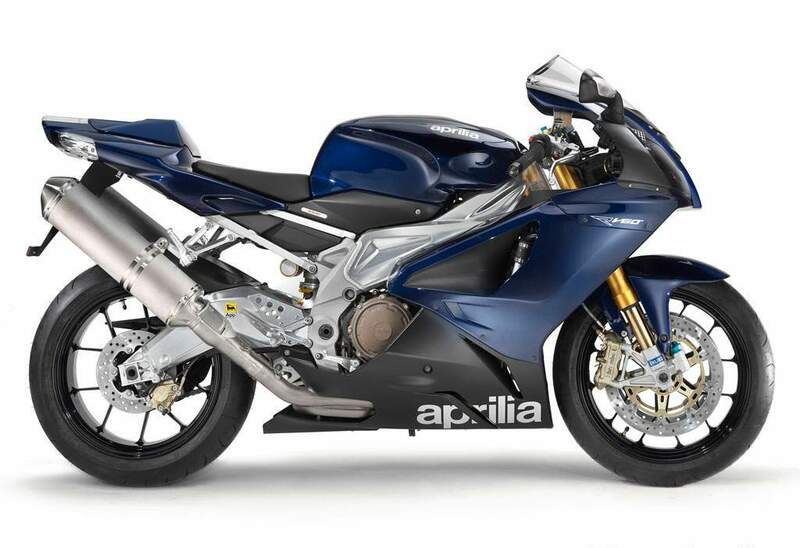 Now that the Ohlins fork comes on the standard R model ('06 is the first year that both the R and the R Factory come with the same front fork), the number one upgrade from the standard RSV1000R is the fully adjustable Ohlins monoshock. The Ohlins unit is better quality than the Sachs shock used on the R model, and back to back on the race track I could feel a pretty big difference. The Ohlins-equipped Factory bike steered quickly and easily, also providing a much more stable feeling under hard braking. I say that the Factory seems to steer a lot quicker and change direction easier due to the Ohlins shock, but the quicker steering could also be put down to the use of forged-aluminum wheels. Forged wheels are much lighter, with 'Y' shaped spokes (six spokes on the front, five on the rear) giving the wheels spot-on lateral and torsional rigidity. These wheels look awesome and weigh 25% less than cast-aluminium wheels, helping the Factory slim down to a claimed dry weight of 408 lbs, 9 less than the standard 417-lb RSV 1000R. Another factor to the quicker steering is the taller rear Pirelli SuperCorsa Pro tire (190/55-17 instead of the 190/50-17 used on the R model). Another extra on the Factory is the adjustable Ohlins steering damper. Personally, I really like steering dampers on the track because they help hugely if something goes wrong. But another good thing is they tend to keep the bike feeling more stable in the front end under heavy acceleration. Carbon-fibre parts are sprinkled throughout the RSV 1000R Factory, including; front and rear mud guards, fairing air vents, cockpit fairing spoilers and a fairing cover on each side. Topping off the extras on the RSV 1000R Factory is a non-slip racing seat cover. So what do $4000 worth of upgrades mean on the race track? The R and the Factory feel similar in most ways and I didn't notice a huge difference until I really started to push the envelope. The main feeling, as mentioned before, was the different steering characteristics. Quite a bit different, actually, but both bikes handle extremely well for a big 1000cc V-Twin. And you can't argue with all that 'bling' that is featured on the Factory. Rolling around the streets is sure to garner plenty of attention with the gold look. Add in the carbon and the RSV 1000R Factory is definitely a one of a kind. Aprilia has had a long association with Slovenian exhaust company Akrapovic, and we had a couple of different pipes to try at the launch in Qatar. When this was announced at the press intro, I was pretty excited; one, because it is good to try the bikes with parts that are available directly from Aprilia, and two, because I have never really had the opportunity to test stock vs aftermarket back-to-back. An interesting thing to note is that the RSV comes with two separate fuel injection maps ready to go when you buy the bike. There is the stock map which is what is used when you purchase the bike with standard exhausts, or if you buy an aftermarket system there is a map that your dealer can easily switch the bike to that is already programmed in to the ECU. On the RSV 1000R I had the chance to try the street legal 2-into-2 slip-ons, which offer approximately a 5-hp gain over standard and are also 33% lighter in weight. These titanium silencers feature noise dampers which can be removed for maximum performance on the track, but easily put back in for the public roads. On the track I feel that the slip-ons really fill up the mid-range power of the bike and gives it that little bit of extra zing off the corners. Not to mention the vast improvement in looks and the roar howling out of the double-canister system. Next up we tried the complete exhaust kit which was mounted on the RSV R Factory. This thing is loud and if you weren't looking at the track as the big Twin screams past, it could easily be mistaken for a full blown Superbike. The full system offers approximately a 7-hp increase and features a weight reduction of 38% over standard. These pipes are serious and offer more power while also extending the use of power available in the range. The full kit also has the noise dampers. Riding the RSV R Factory with the full system is really fun. Corners where third gear was kind of lagging were now just a case of opening the throttle and away we go. The bike is stronger throughout the rev-range and feels 'cleaner' overall. Both systems were an improvement over stock, and just like our test bikes I recommend the full system if you're willing to pay the extra for the Factory, but the slip-ons do a good job and are a big improvement when mounted on the R.